It’s only been less than a week since Michael Bay bludgeoned the world with Transformers: Age of Extinction, and while the critics have not been particularly kind to the film, it has still raked in more than $381 million across the globe. And just because the movie is still relatively new to theaters doesn’t mean that Paramount doesn’t already have their eyes on the future. They recently unveiled the spectacular packaging for an upcoming special edition Blu-ray, and the producers have already started thinking about possible new additions to the franchise. 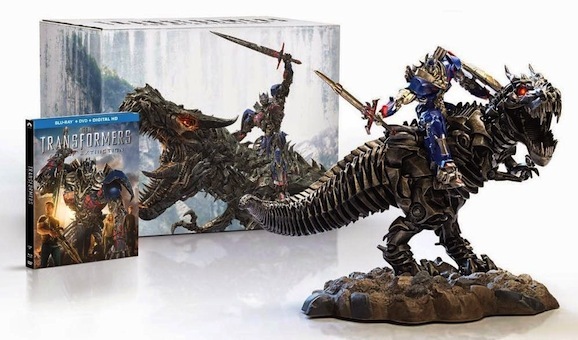 I haven’t seen Age of Extinction yet, and to be honest, I don’t know if I’ll get to it in the theaters—there are a lot of films ahead of this one on my need-to-see list—but I do want to own this Blu-ray. There’s no official release date yet, and not word on the extras, but you can already preorder it on Amazon. The most memorable image from the glut of marketing, one that was used with great frequency, is that of the Autobot leader Optimus Prime riding on the back of the Dinobot named Grimlock, who is essentially a robotic fire-breathing dragon. It is completely insane, over the top, and if I do pay money to see this in the theater, it will be because I want to see this blasted on a screen many stories tall. 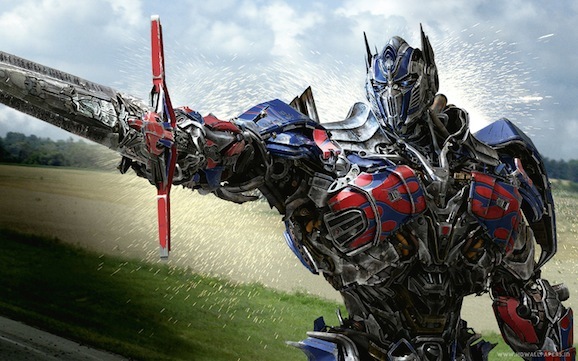 Michael Bay’s Transformers: Age of Extinction is set to open worldwide this Friday, June 27—unless a lawsuit in China delays the release there—and it is sure to be one of the biggest movies of the summer. Even though the previous movies in the franchise have earned billions of dollars—billions with a B and an S—that doesn’t mean that Paramount Pictures is going to be content to rest on their laurels and not promote their movie. Oh no, that’s not how they role at all. In fact, the closer we get, the more we see, including this latest short TV spot. And when we say short, we mean very short. This video may only be 15-seconds long, but almost all of those seconds are full of new footage. Considering that Bay is fond of shots that are measured in nanoseconds, you can fit quite a lot of shiny new film into a spot this brief. The world is about to be invaded by giant shape shifting robots from space, again. Are you ready? Michael Bay and company will unleash Transformers: Age of Extinction, the fourth in a multi-billion dollar earning franchise, at the end of the week. Early reviews of the film have started trickling, and have been mixed-to-positive, but the cinematic juggernaut has hit a speed bump, one that could lead to some last minute edits. Yahoo reports that a property developer based in Beijing, China, has filed a lawsuit demanding that one of their properties be cut out of the film before it opens there. Beijing Pangu Investment Co. Ltd is suing both their business partners and Paramount Pictures. They own a hotel that is apparently shaped like a dragon, which is a great idea in itself, and claim that Age of Extinction fails to fulfill an agreed-upon sponsorship deal.